I grew up close to Oxford but not close enough to develop a rowing habit. 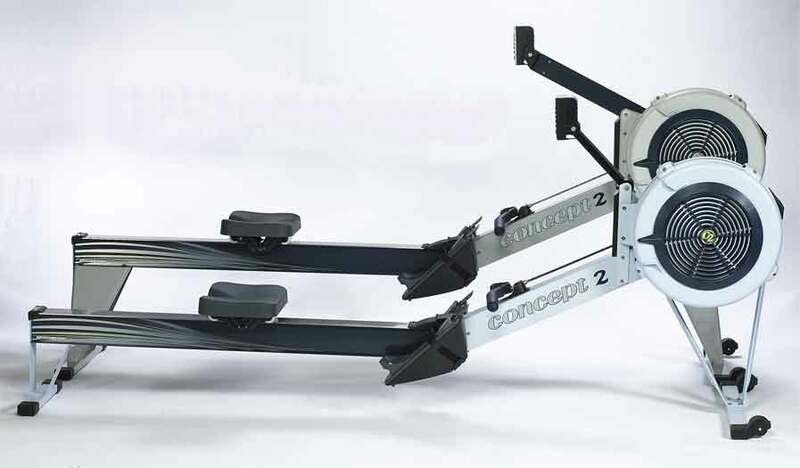 So my closest connection with rowing has been in a gym, and it turns out I’ve been using rowing machines incorrectly for years. And I’m probably not the only one. I live in SE London, about three miles from the Thames, and I’ve spent a fair bit of time walking, running, and cycling along the riverbank – but not so much on the river itself. My nearest rowing club is Globe Rowing Club in Greenwich. The club was originally formed at Stones Engineering Works in Deptford, and has been based at a number of Greenwich pubs over the years. Richard offered to show me around the club, as part of an introductory tour he was running for two prospective members. He explained how and when crews go out on the river and use the gym, relationships with the London Port Authority and other local rowing clubs, the difference between the stored boats, and gave us a tour of the club facilities – the gym, boathouse, and clubhouse are in separate buildings but it only takes a couple of minutes to walk between them. Richard told me the club had discussed my challenge and had decided it would be better for me to complete as much of the rowing event as possible on dry land. One of the club’s requirements is for novice rowers to complete a beginners’ course before taking to the water. Even the two men who I’d joined on the introductory tour were planning to complete the beginners’ course because it had been more than 10 years since they’d last rowed. Trying to hide my disappointment and relief, I followed Richard into the gym and he showed me how to row on the Ergo indoor machine. After a few minutes watching him, I sat down on the Ergo and started moving backwards, pulling hard on the hand grip. I tried and it felt so much more comfortable compared to what I’d been doing. So comfortable, I was able to chat with Richard without gasping for breath. Which he spotted, and changed the display on the machine. I became obsessed with the shape on the display – and forgot about the sequence of moves, until Richard reminded me and I glanced in the mirror at my hunched-over body. 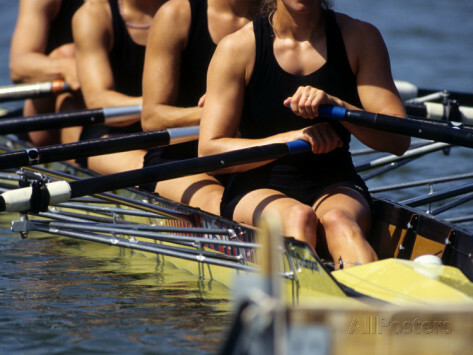 Women have competed in rowing events at the Olympic Games since 1976 in Montreal. 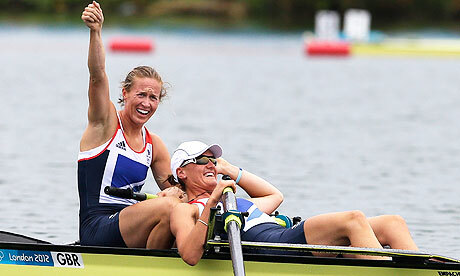 For Rio2016, women will be competing in single, double, lightweight double, and quadruple sculls, coxless pairs, and eights. 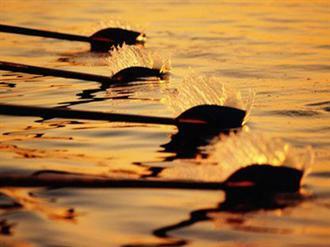 For sculling, each person uses two oars. For pairs and eights, each person uses one oar. Since the Stockholm Olympics in 1912, all races have been raced over a 2000m course. 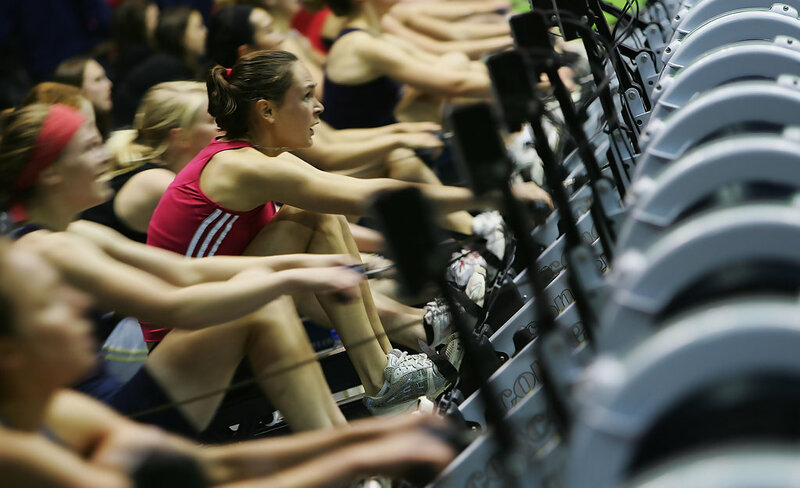 Women rowers competed at the Olympics for the first time in 1976 in Montreal. At London2012, Great Britain was the most successful nation, topping the medal table with four golds and nine medals in total. And Helen Glover and Heather Stanning, TeamGB’s first gold medal winners at London2012 and undefeated since 2011, look in good form to repeat their rowing success at Rio2016. Based on my first Ergo session, Richard calculated it would take me about 30 minutes to row 5000m (which is the distance Globe rowers regularly cover in a training session on the water) and invited me back a few weeks later to row 2000m, 5000m, maybe even 10,000m on an Ergo. When I arrived at the gym for the second time, a training session had just finished and I explained to members of the women’s team what I was planning to do. They suggested 2000m and 5000m would probably be enough for a first session, which was good enough for Richard and I. After a warm-up (legs only then legs and arms) I began rowing. We talked about famous rowers, rowing challenges, tides and flooding, Thames river etiquette, why people start rowing, what clothes to wear, whether rowing complements other sports, falling in and out of love with rowing, whether body shape and size affects rowing, learning to row as a child or an adult, perceptions of rowing and rowers. It felt comfortable and I was surprised I was able to keep talking. On I rowed, imagining I was making my way along the Thames, the Isis or Bulstake Stream (Hello Mary!). We talked about rowing across the Atlantic – which won’t feature as a future challenge because my sister’s told me about her experiences sailing across the Atlantic. Suddenly I was approaching 2000m and Richard asked if I wanted to go on. 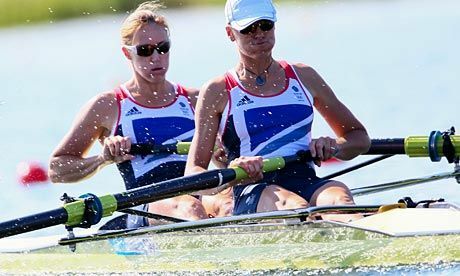 When I checked the times for London2012 later, I learned TeamGB’s Anna Watkins and Katherine Grainger had finished the double sculls in 6.55.82 and Miroslava Knapkova, of the Czech Republic, had finished the single sculls in 7.54.37. Richard was right. They rowed faster than me. On I rowed. We talked about some of the other sports I’d completed – which ones I’d enjoyed, which ones I hadn’t, the ones I was looking forward to, and the ones that filled me with nerves. We talked about the difference between indoor and outdoor rowing, and the popularity of indoor rowing competitions. I told Richard about the coxless pair I’d seen at Vogalonga in May, who’d rowed steadily and powerfully into a channel post near Burano. Over the next 2000m my breathing became more laboured and I found it more difficult to chat, so I tried to ask Richard questions to give me time to get my breath. He noticed my tactic and pointed out the erratic shapes I was now creating on the display: the lovely gradual curves had been replaced with sharp spikes. At 4000m I decided to get back on track with my pace and technique. I moved up and down the Ergo, making sure my body followed the right sequence. And I reached 5000m. It took me 28.55 minutes. 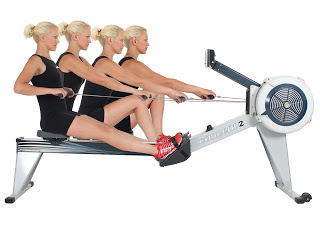 Using the Ergo gave me a good idea of what it could be like to row for distance. Now I know the correct technique, it’s whetted my appetite to find out what it’s like to row, on my own and with a team, on water. If I get the chance, I’ll definitely give it a go.